Love it, but wish it could do more for my hair. I love the scent the most of all, but it does absolutely nothing in the way of moisture or keeping my hair from frizzing. I have to use another leave-in product after washing my hair to keep my thick, curly hair in line and I wish I didn't have to. I wish this conditioner was thicker and could give my hair the much needed moisture it craves. An okay conditioner that has an amazing scent! 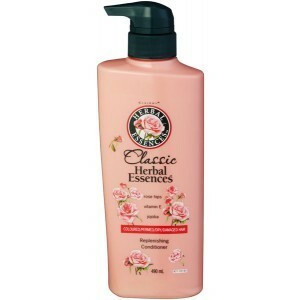 Clairol Herbal Essences Classic Replenishing Conditioner is definitely a "classic" for me. I used it for years and years throughout my twenties. It is not the most fantastic conditioner I have ever used, but I was not facing as many problems with my hair then as I am now. It definitely got the job done, however. After using this conditioner, my hair felt soft and manageable. It kept my hair from looking too terribly brittle or damaged. The most amazing part of this conditioner is the scent. It smells so good! I have always loved Herbal Essences products and this conditioner is one of them. I loved how my hair smelled after using this product and I would use it again, even though it was not as helpful to my hair as other conditioning products I have used since this particular product. I would recommend this product, for the scent alone. It was so good and I absolutely loved it. Wonderful scent, but not for extremely damaged hair. I love this product because of its AMAZING scent. 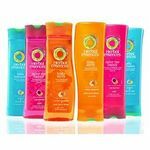 Few conditioners can beat Herbal Essences in their scent selection. My hair is damaged and very fine, so its a hassle to find the perfect conditioner that will make my tresses much more manageable. While I enjoyed the scent, the product did not hold up to being a great conditioner for my hair. I did not understand what the term "replenishing" stands for, but I guess it did not replenish my hair as expected. A thicker consistency might have elevated this conditioner to being more supple and helpful at eliminating my frizz. Effectiveness I would prefer a thicker consistency conditioner that bonds well with my hair in order to offer maximum protection against everyday styling. Scent Scent is unbeatable. I got plenty of compliments on my hair after using this product. This is purely amazing to use if you have a boyfriend or husband who enjoys smelling your hair! A great conditioner chemically treated hair. About a year ago I permanently colored my hair. I noticed that shortly after my hair started breaking. My hair seemed to be getting thinner and the amount of elasticity decreased. I needed to use a conditioner on my hair that would strengthen it and help repair some of the damage done to my hair. This is not a conditioner that I had used before. After looking for a new conditioner, I decided to try this one to see if it would help my hair at all. From the start, I fell in love with the smell and how it made my hair feel. The conditioner in a matter of a couple of weeks not only strengthened my hair but made my hair even look healthier and shinier. I love the fact that I can purchase it over-the-counter and it's not too expensive. The conditioner can be used by people with all hair types. It is not watered down or cheap. The conditioner gives my hair the body and manageability that it needs to wear hairstyles that are long lasting and care free. My hair is tangle-free and feels like I've gone to the salon and had a professional do it. The conditioner does what it says it will do and makes my hair look and feel better. I love the results I get every time I use this conditioner on my hair. I have long hair and it was really damaged especially at the ends and tangles were always a problem with as long as I like to keep my hair. This conditioner has been an amazing addition to my every day hair care and my hair is much healthier after just a week of using this great conditioner. 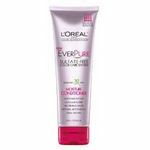 Effectiveness This conditioner does everything it says it should and I love the added benefit of better hair health. I no longer have tangles all the time and the dry ends of my hair have been repaired. Scent I am very sensitive to a lot of highly perfumed products but the smell of this hair conditioner does not bother me and I actually would have to say that this hair product has one of the best scents that I have ever experienced. I love the fresh and clean fruity scent that it leaves behind on my hair and it is not over powering at all. This product does a great job on dry hair. It could be categorized as a damage repair conditioner, really. I like the way it takes out the snarls and leaves my hair super soft and fully manageable. It's hard to find conditioner that actually does these things, so this is a keeper! Effectiveness Very effective. My hair has been through the wringer, and this conditioner perks it up and keeps it at its best. I'm very pleased with the results! Scent I really like the scent -- very fresh and a little zingy. You can detect the rose fragrance in particular. This is a great conditioner. It's very gentle on the hair and leaves it very soft. It doesn't leave your scalp greasy, but it is still moisturizing. The vitamin E in it helps your hair keep its shine and stay healthy. The scent is very fresh, with a flower undertone. The scent isn't overwhelming, but it is still long lasting. The price range is very affordable for the great results. A great thing about this conditioner is that it's sulfate free. When I first used this conditioner, i noticed that i was very creamy. I can anxious to see if it would be to rich for my type of hair. I was surprised to see results just after the first application. My hair was so smooth and easy to comb after my shower. The day after i took my shower, my hair was still hydrated, even the ends. I was quite surprised since most of the conditioner i tried were not that long lasting. I am very satisfied with this product and I recommend it. i love love love love love herbal essences's replenishing conditioner because it actually works on my hair! 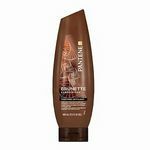 it completely hydrates my hair and makes it really really smooth and silky! i straighten my hair almost every single day and dye it quite frequently so it's important for me to have a conditioner as well as shampoo that can pretty much heal my hair since i do not buy heat protectant products for my hair. i've been using it for about a few years now and would not think of switching hair products! not only does it smell great but it does not weigh down my hair or make it flat or fluffy! sometimes it's a bit pricey but it's worth the little extra money for such a great product! the scent of this product is soooo amazing and i would not even change it! i would most definitely recommend everyone and anyone to try this product! you will not be disappointed from it one bit at all!!! oh and the only downside is if you use too much at one time it will make your hair a little greasy! Smells so nice and keeps my hair soft!! I really love this conditioner as well as the shampoo that goes with this. The only problem is that not many stores sell this shampoo. The only place I have seen it in is select target stores. Other than that, no other stores sell it. It is still packaged in the old shampoo bottle of Herbal Essence. This conditioner not only leaves my hair so soft, it smells sooo good and heavenly! Everytime I use it, someone asks me what shampoo I am using because it smells good. These days Herbal Essence only seem to like those fruity scents, that doesn't smell as nice on your hair. If you are able to find this shampoo at your local store, I suggest you try it! It leaves hair silky smooth and smells so good. The only bad thing I noticed about this conditioner is that my hair seems to fall off more!? I guess I am using too much at a time or what not, but thats what I noticed when I use Herbal essence conditioners in general!